This modus operandi started out being about one thing, morphed into a second exploration, and ended up in far left field. If you include the subsequent “best laid plans gone awry” epiphany, I’d say it’s a grand slam! Today’s subject was first inspired by the July/August issue of Somerset Studio, which includes a feature on art inspired by Provence. While enjoying the art, I also wondered who among the contributors had spent time in Provence and who was working from pure fantasy. I’ve seen similar showcases, of course, about Paris or New York City; obviously locations seen as romantic, thrilling, or remote can be an impetus to art, but I wondered what could be learned by looking closely instead at what is in front of us—our own states, neighborhoods, and homes. I thought I might be on to something worth exploring further and started to consider a modus operandi about finding inspiration in your immediate surroundings, about seeing and valuing what is right in your backyard. Or, in my case, my front porch. 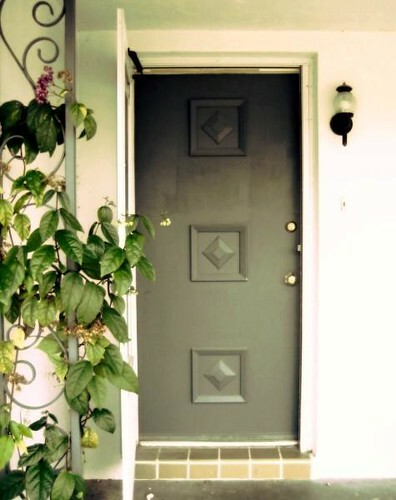 As a starting point, I took this photo of my front door. Unexciting, but I foresaw using it as the model or basis for some art making. 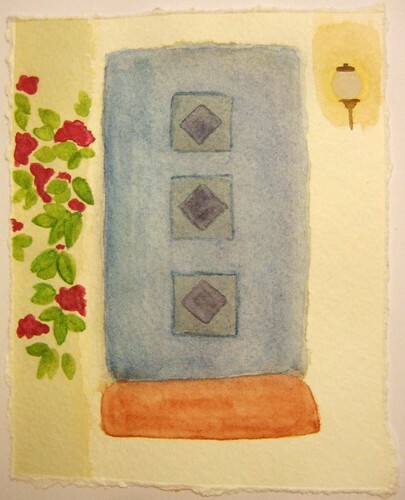 I did sketches of the door, both from the photograph and the actual object, then created the following watercolor portrait of my door. This ongoing comparison whilst painting, led me to remember reading about watering down acrylic paints to get some of the same effects of watercolors and wondered how the techniques compared. I had some expectations of how things would work or differ, but no first-hand knowledge. Curiosity got the better of me, and I made a new version of my front door, this time using watered-down acrylics. I learned a lot about the properties of each type of paint by doing these back to back and by having the two final pieces to compare. Looking at the two paintings side by side, I was distracted from my exploration of technique by wondering what else you could learn about your subject and your perception of it by tackling the same subject in a variety of media. By this point, I had some fairly typical representations of my front door: a photograph, sketches, a watercolor, and a acrylic painting with watercolor pretensions. I was sure I could go further. What about embroidery or fabric? I looked again at the door and thought about its blocks and realized it would be simple to recreate the effect with fabric. 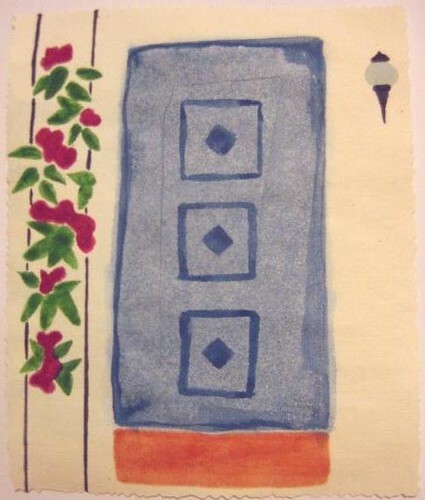 With some pieces from my scrap pile (a piece of upholstery fabric, remainders from a sarong and a veil, for the record), I abandoned recreating the exact photograph of the door and climbing vine and made this representation of the shapes of the door. Where else can you take the subject? 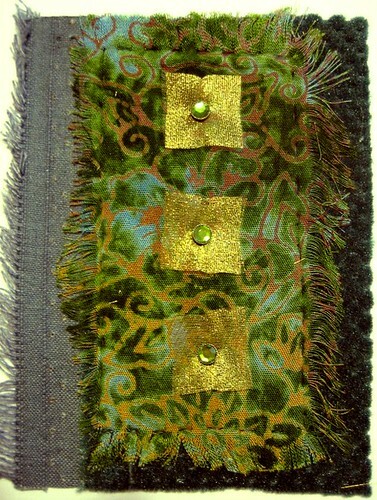 Just as I focused on the shapes in the fabric piecing above, what if I took only the colors into consideration? What if I wrote about this door, listing the people who had crossed its threshold or made a poem considering some aspect of it? What if I sang about my front door? Obviously, this is where I realized I was out in far left field,* but even just exploring these ideas without executing them made me think differently about the door—just as sketching a squirt bottle earlier this month was a way to meditate on that object. 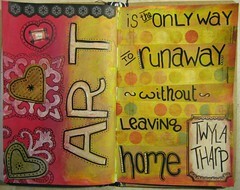 What is readily available for you to make art about? What do you look at every day, but not really see? Fantasies of Provence and the Big Apple are good fodder for art, too, but there’s something quite remarkable about using this opportunity to really see what is in your immediate surroundings. What can you learn about a familiar medium by changing it slightly? What are the strengths and weaknesses of each technique in your arsenal? How many different ways can you approach one subject, be it place, person or object? How does each inform the next and change what you see in the subject? 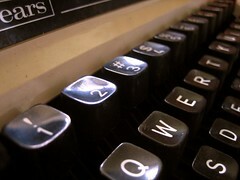 Have an idea for a future modus operandi feature? Want to know how I achieved a certain effect or what I used to make a project? Leave a comment below or e-mail me at miscellanea (dot) arts (at) gmail (dot) com! * Really, I’m tone deaf, so the last thought was a good sign to stop! Earlier in the spring, I signed up for a watercolor class and for an acrylics class and learned the hard way that for a true novice, mastering one before trying the other makes a lot of sense! How wonderful to read all of your thoughts and feelings. I too am a goddess although the kitchen and garden are my realms. Keep going………….